I would guess that most squirrels are shot at 25 to 40 yards, though an accurate .22 and good shooting skills will allow head shots out to 50 yards or so. And, by pure chance, a scoped .22 is unique in the shooting world, with a seemingly flat trajectory throughout all of this, its normal hunting range. A properly sighted-in scoped .22 has squirrel-in-the-head potential from 20 yards all the way out to 55 yards. Just aim and shoot. The trajectory is so flat a hunter may simply ignore it. Sight in the rifle to hit at 25 yards, and beyond that, the still-climbing bullet and the downward pull of gravity wrestle each other to a virtual standstill. The bullet hits no more than a fifth of an inch high from 30 to 45 yards. Then it drops to zero again at 50. At 55 yards, the bullet hits just a fifth of an inch low. Beyond 55 yards, however, its drop is very apparent, hitting almost 2 inches low at 75 yards and more than 5 inches low at 100 yards. All bullet trajectories drop faster once the initial climb is past. If you shoot any rifle perfectly flat along the ground, and drop a similar bullet beside the rifle at the same time, both bullets will hit the ground at exactly the same time. True, one of them will hit far downrange, but gravity will pull them both to earth at the same pace. However, it is not a steady pace. Rather, the drop rate accelerates with time, whether the bullet falls straight down or along the trajectory of a fired bullet. Drop velocity increases 32 feet a second, every second, and the bullet’s slowing speed compounds that ever-increasing bullet drop. This is why bullets drop faster the farther they fly. And, perhaps surprisingly, shots at very close can be challenging, too. Bet an experienced squirrel hunter that he cannot hit an aspirin tablet with his scoped .22 at 15 feet, and you will probably win the bet. His scope will likely be zeroed at 25 yards, and it’s tough to guesstimate exactly where the bullet will hit at 15 feet or anywhere else before it reaches 20 or so yards. The bullet leaves the muzzle an inch and a half low (at least according to the scope picture) and climbs quickly to that zero at 25 yards. 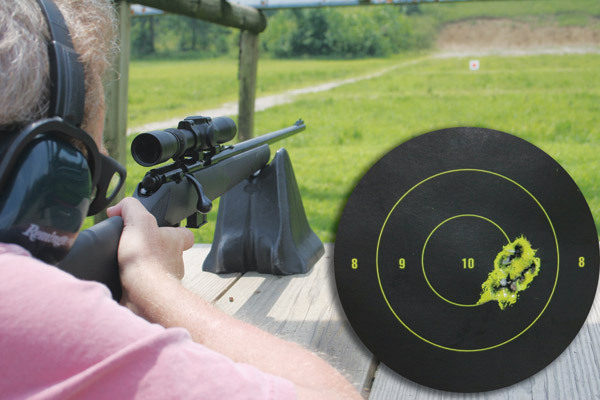 The seemingly flat trajectory from 20 to 55 yards is actually unique to rifles with high-mounted big-game scopes. The fact that the scope sits higher than the muzzle makes the whole thing work. Most iron sights are situated just a half-inch over the bore, which changes the trajectory curve. An iron-sighted .22 sighted in for 25 yards hits a half-inch low at 40 yards, easily missing a squirrel’s head. Zeroing an iron-sighted rifle at 50 yards is not a simple answer, either, as it will then hit more than a half-inch high at 25 yards, which is actually a more typical shot when hunting squirrels. The best compromise with iron sights may be to sight in at 35 yards and get less than 1/5-inch variance from 25 to 40 yards. One consolation for the guy shooting the open-sighted .22 is that he should have an easier time of it hitting that aspirin at 15 feet. You might also mount the iron sights an inch and a half above the bore and get the same flat trajectory as with the scoped rifle. I know that sounds a little crazy, but it really would work. Trappers are a bit unique in requiring precise .22 bullet placement at very close range, to quickly and humanely dispatch critters in traps. Here, low-mounted iron sights are ideal. But zeroing for a 5-yard shot might not be ideal, as the bullet would continue to climb relatively steeply and hit more than an inch high at 20 yards. Perhaps better would be to zero at 15 or 20 yards and then allow that the bullet will hit a quarter-inch low at 5 yards and a tenth-inch low at 10 yards. Regardless of how the sights are mounted and aligned, 50-yard head shots on squirrels require an accurate rifle, and with few exceptions, field-grade rimfire .22s come with terrible triggers that hurt shooting accuracy. Your local gunsmith may help a bit, but the simplicity of these inexpensive triggers thwarts much improvement without compromising safety. Don’t be surprised if he says he just can’t improve it enough to be worth the bother. For a great trigger out-of-the-box, look to Savage. They recently added the fine AccuTrigger to all Savage bolt-action .22s (the economy-line Stevens .22 does not come with the AccuTrigger). This trigger can be adjusted by the shooter for anywhere from 6 pounds pull pressure down to a very crisp 2 pounds, or even slightly less, and a simple safeguard against accidental discharge allows the trigger to be set safely at this lightest pressure. Should the gun be dropped or bumped, a blocking mechanism prevents it discharging. A small lever on a very light spring must be depressed to disengage the block, and this lever is mounted inside the trigger itself. As your finger squeezes the trigger it also depresses the lever, almost without you feeling it. Other rifle makers have been playing catch-up ever since. The .22 rimfire is often compared to the faster-stepping, superbly accurate .17 rimfires, a fairly recent development that took off almost from day one. To create the .17 Hornady Magnum Rimfire cartridge, Hornady necked down a .22 magnum case to accept a 17-grain .17 bullet. Muzzle velocity averages 2,550 feet a second, and accuracy is outstanding with groups smaller than 1 inch at 100 yards—and that’s from field rifles. Putting that same bullet atop a .22 LR case (actually a slightly longer CCI Stinger case) produced the .17 Mach II. This one flies at a little more than 2,000 ft/s and may well be the ultimate rifle for squirrels and rabbits at 50 to 100 yards. The .17 HMR is a little too explosive for body hits on squirrels, but the .17 Mach II does very little damage to the meat. Groups with the Mach II are twice as tight as what may be expected from a comparable .22, beating all but the best target-grade .22 rifles. Surprisingly, however, the slower .22 LR still provides a better trajectory for hunting squirrels at 20-50 yards. The much hotter .17 Mach II, sighted in at 25 yards, has so much zing it keeps rising and hits more than 3/4-inch high at 45 yards. Still climbing, it will miss a centered hit on a squirrel’s head at every distance until it drops back down close to zero at more than 100 yards. Zeroing the sights at 50 yards may help, but then it hits a half-inch low at 25 yards. That’s why I still say an accurate, scope-sighted .22 LR is the ultimate squirrel rifle. Besides, the ammo is much cheaper when I just want to plink around.